When I think of Italy, I think of wine. I know they have one internationally known beer, Peroni, but was quite surprised, in fact, to find they have a craft brewer, Amarcord Brewery. What I have learned is that the brewery was started in the early 2000s in Rimini, on the Adriatic Sea, in the northern part of Italy by "a group of young friends, all great beer enthusiasts and experts." As they grew, they went on a search for a source of pure water that would be ideal for brewing. They chose a site in the nearby Republic of San Marino, the oldest republic in the world. 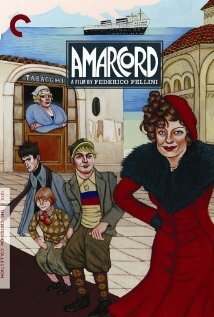 The brewery is named after a favorite Federico Fellini film of theirs, Armacord. The labels on their beers depict characters from this film. And the beer? I have two to try today which I picked up at the Beer Boutique. 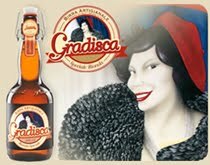 First to the 5.3% La Gradisca Special Lager. Note: La Gradisca was the hairdresser in the movie. It pours a golden colour with a nice white head. There are some lacings along the inside of the glass but they are few and weak. It does have a nice floral hop note in the aroma. 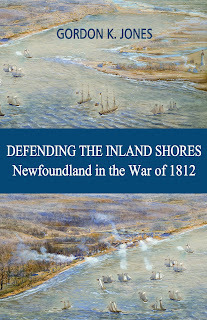 I am looking forward to this. This has a very nice taste to it. It starts with very little flavour but then the hop notes come through and, in the end, finishes with a slight bitter hop note. I find this a very enjoyable lager. 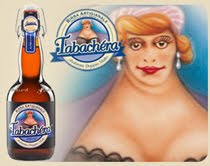 The other one I picked up was La Tabachera. From what I understand, it may have been named after or inspired by Amarcord’s buxom “Tobacconist” character. According to the image on the label, this may very well be true. It pours a coppery colour with a white head. There is a good strong aroma to this. The lacings are much better and stronger in this one, remaining at length on the side of the glass. I am surprised by the taste. Although it is 9% APV, it does not have the hot sting of alcohol in it. It is a sweet malty beer, and although not complex as some ales of this strength, is very pleasant ale to drink. There are two other beers that this brewery produces and after the pleasurable experience I have had with these two, I would love to get a chance to try them. I may even try to watch the movie sometime!